Celebrate Spring with a Picnic! Here at Sunset, we don’t just write about food: we live and breathe it. Whether we’re obsessing over ways to make gourmet s’mores, testing our limits with the Sunset Eat Fresh Challenge, or hunting for the West’s best taco, we are serious. We’re also seriously into sharing recipes, so back in November, we decided to take our obsession online with the Sunset Cookbook Club. Each month, a group of Sunset staffers chooses one or more inspiring cookbooks by Western authors and we…cook the books! Each of us makes one recipe, and then shares his or her results here on Westphoria. This month, with warm weather beckoning us outside, we’ve picked The Picnic, a lovely little book by friends Marnie Hanel, Andrea Slonecker, and Jen Stevenson, who live in Portland. These ladies love picnicking so much that, four years ago, they founded the Portland Picnic Society—a group whose joyful attitude and bright picnic attire soon attracted quite a following, including us, at Sunset. (We asked Marnie to write about her club in our May 2013 issue.) So it’s no surprise that this book took shape. 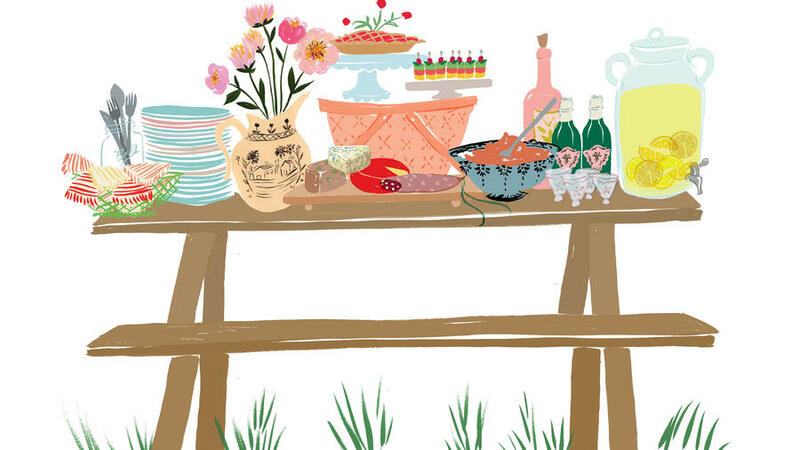 Charmingly illustrated by Emily Isabella, the book is packed with wonderful recipes—and also tips and tricks for planning a successful picnic. Rather than just make recipes at home, as we’ve done in previous iterations of the Sunset Cookbook Club, we felt that this book needed to be experienced in full: that is, we needed to test out the detailed packing and planning suggestions. And so, together, we’re going on a picnic, guided by The Picnic. We’ve narrowed down our recipe choices, after much (much!) deliberation because they all sound so good, into a fairly coherent menu, ranging from Shocking Pink Beet Hummus and Homemade Quick Pickles to Lemon Lavender Cream Pots. Now it’s time to start cooking—and break out the sundresses. A little recap of last month’s Sunset Cookbook Club: We dove into Zoe Nathan’s Huckleberry. *Digital Editions Managing Editor Erika Ehmsen took on a deep-fried challenge—and won, ending up with crisp-delicious Lemon Ricotta Fritters and a kitchen that smelled like the state fair. *Senior Copy Editor Trina Enriquez decided to give avocados a chance, and loved the Smashed Avocado Toast so much that she made it again for breakfast the very next morning. *Associate Art Director Soni Obinger jumped headfirst into the world of gluten-free baking with the Gluten-Free Vegan Banana Chocolate Muffins. *Deputy Editor (and avid baker) Miranda Crowell went for the glory, baking the Fresh Blueberry Brioche that graced Huckleberry’s cover. *Home Editor Joanna Linberg—a.k.a. The Pancake Goddess—discovered the perfect recipe hack for Vegan Gluten-Free Pancakes with Maple Berry Compote. *Deputy Art Director Supriya Kalidas, an enthusiastic cook, stepped outside of her comfort zone and baked a delicious Tomato-Goat Cheese Cobbler. *Editorial Assistant Emma Wartzman—a serious Zoe Nathan devotee—jumped at the opportunity to bake Chocolate Chocolate Teacake, a cake perfect for all occasions. Want more ideas for perfect picnic recipes? Check out these awesome portable dishes.